On Friday, May 18, 123 Cleveland Institute of Art seniors celebrated commencement at Maltz Center for the Performing Arts—representing 15 majors from Game Design to Printmaking to Sculpture + Expanded Media. It's been a busy month for CIA's graduating class, as the seniors defended their BFA theses in early May, then celebrated the conclusion of their CIA experience with a BFA reception and campus-wide public exhibition. First-year CIA students begin with the Foundation curriculum—a yearlong intensive exploration of color, form, design, and creative problem solving geared at helping students pick a career path. Initially, Steve Aviton had chosen Fine Arts as his focus, but later gravitated to Industrial Design. “I was always a kid who liked problem solving as well as the actual process of problem solving,” says Aviton of why product design stood out to him. Aviton feels that CIA fully prepared him to understand the end user of his designs. He asks himself, “What do [users] need?” His research of the medium is what led him to find his own style, which consists of starting designs on paper and then scanning them into a 3D program called Solid Works to complete the design process. 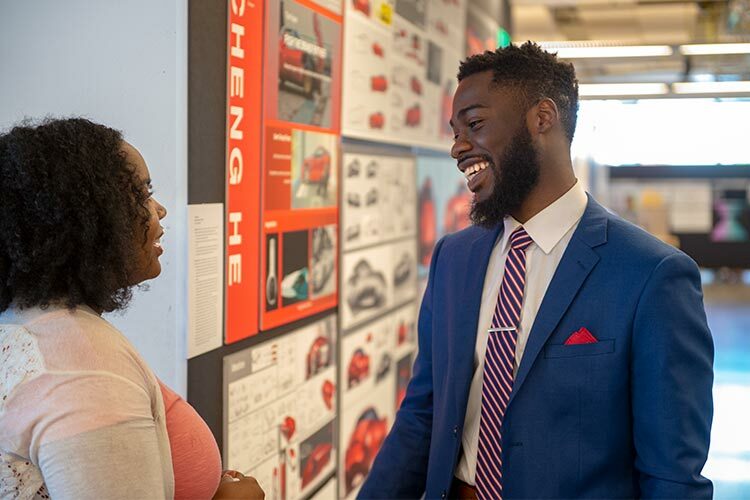 Following graduation from CIA, Aviton has accepted a six-month internship at Tesla, with the possibility of working full-time for Tesla following his internship. His portfolio can be found at https://www.behance.net/Aviton. While Davon Brantley mostly uses oil paint for his art, he also uses a variety of different mediums including drawing, installation, video, and performance. He uses art to bring attention to the psychological condition of Dissociative Identity Disorder as well as those who have experienced childhood trauma. CIA helped him grow as an artist by allowing him room to explore his creativity and different mediums. Having graduated from the drawing department in high school, Brantley's initial focus was on creating traditional portraits, but he felt there could be more to the narrative behind the art. He says CIA developed his skills to be able to talk about the connections between the artwork and topics about which he feels passionate. “I now create self-portraits to use myself as a platform as an African-American man who is working through his problems,” says Brantley. Currently, Brantley is creating commissioned work and applying to various art shows in Cleveland. He plans to work with non-profit organizations in order to give back to the community and advocate for the arts. 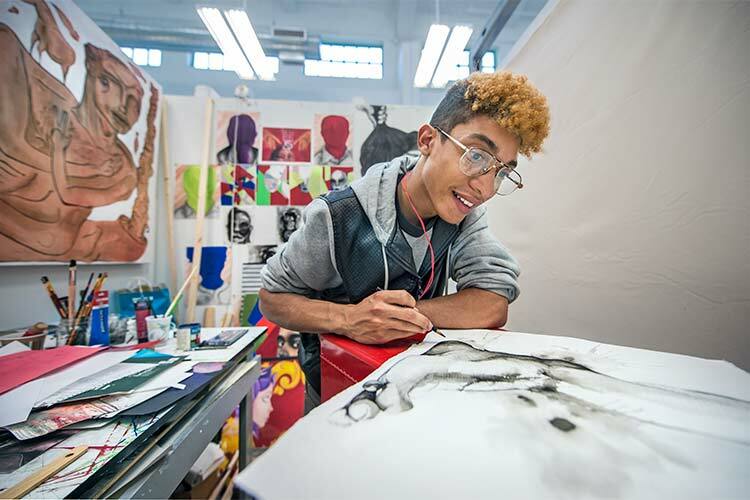 Brantley aspires to travel throughout his career, spreading the word about art and developing new bodies of work that speak about different societal issues. His focus is to give a voice to those who may not have a voice. As a Jewelry and Metals major, Meghan Sweeney specializes primarily in enamel and casting. The Foundation year at CIA was crucial for her because it taught her how to use creativity in problem solving. 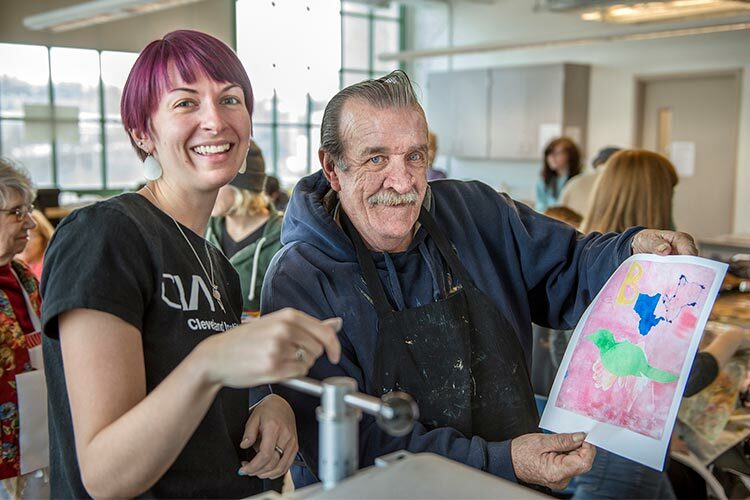 She attributes the wealth of knowledge that she gained to her experienced professors, as well as a program called “Engaged Practice" (through which students get involved with a community organization). “It is unique because it flips the script of the isolated artist and encourages them to connect with others in the community," says Sweeney. For her artwork, she takes natural objects like leaves and petals and fills in the holes and gaps with enamel. The enamel creates an almost stained glass effect when the sunlight hits it, which helps her jewelry stand out. Sweeney has worked at Wanderlust Jewelers in Cleveland Heights for over a year and plans to continue working with them following graduation. She aspires to build her own production line of jewelry and create custom work. Currently, she has a few pieces of her jewelry for sale at Flux Metal Arts in Mentor. He says there are two facets to his glass work—the formal and the metaphorical. 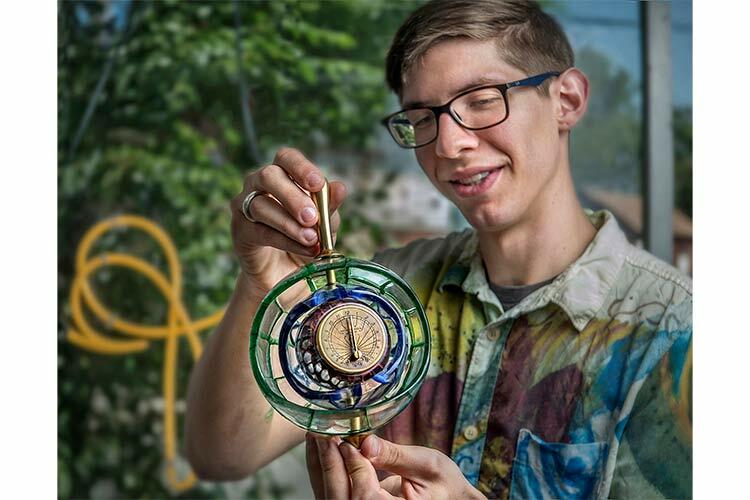 The former stems from the fragile nature of glass and the reluctance to break it, so he aims to create connective pieces that can be handled by anyone. For the latter, Mentz considers the observer’s meditative response to the object, producing optical illusions within his glass pieces so observers can interact with it. He wants the experience of interacting with his artwork to be reciprocal—what can the object give back to the viewer? Mentz plans to spend the next three months in Indianapolis, where he feels the art scene is a bit smaller than Cleveland. There, he will devote his time to community outreach teaching in the non-profit sector. 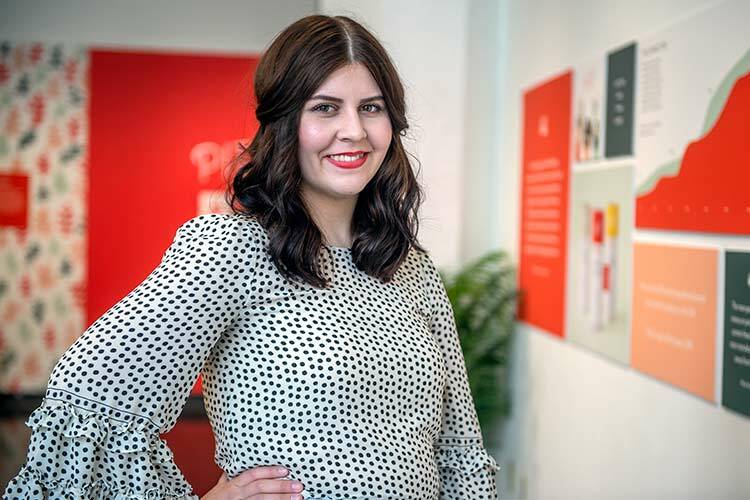 Jacqui Evers initially came to CIA to study biomedical illustration, but later transitioned to graphic design since she finds it "a lot more creatively fulfilling." Specifically, she plans to pursue a career in app design—helping to create smoother, more appealing user experiences and interfaces. "I took a class in user experience design, and that professor was the one who got the wheels turning in my head," explains Evers, citing the Podcasts app on her iPhone as one of her design inspirations. Evers feels the most beneficial part of her experience at CIA was the intimate, immersive nature of the coursework. "Larger universities have lecture-style classes with 100 people, whereas this felt more like a studio environment," says Evers. "At CIA, we were held accountable more, and that style suits me best. If I didn’t have deadlines and people checking in on me, I wouldn’t be trying as hard." Clearly, CIA's approach did suit Evers, as she was chosen as this year's commencement speaker. "A lot of my speech focused on how integral art is to our daily lives—cars, films, and all the applications of art and design that often go unnoticed," says Evers. "My message was about how art and design can solve problems."